So I read THE THIEF (read my review) last year and enjoyed it so much, I immediately went out and bought its’ sequels. But even still, it took a bunch of prodding from Angieville for me to finally dig out THE QUEEN OF ATTOLIA from the middle of my TBR. Gen, our Thief from book 1, once again finds himself in a tight spot after being caught by the queen of Attolia. What transpires between Gen and the queen sets off a war between their countries. Meanwhile, neighboring countries plot and plan, trying to gain advantage. Gen must now somehow find a way to steal the biggest treasure yet – lasting peace between the nations. Turner excels at literary sleight-of-hand – focusing your attention on something else entirely while she sets up major twists right under your nose. After a dramatic opening, the plot builds slowly as the kings, queens and advisors move their pieces around the playing field. Everyone underestimates Gen because of the tragedy that befalls him early on, but as we learned in book 1, Gen is not to be underestimated. What I most enjoyed about the story though was Gen’s character growth. In book 1, he was clever, certainly, but also borderline unlikable for most of the book. Here he actually begins to grow into a swoonworthy romantic lead, and the transformation is stunning. Thanks Angie – we certainly have a lot to talk about at BEA now. I can’t wait! 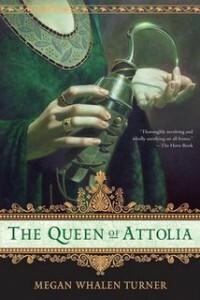 THE QUEEN OF ATTOLIA is available in paperback. Find out more about the series at the author’s website. I'm glad to hear a positive review. I recently won the whole series and can't wait to start it! Thanks for sharing. For me, the characters and their development are always so important in a novel. I will be looking for these next time I am in a bookstore as they sound intriguing. Kings, queens, war, treasure - what's not to love? I love this series! But I don't blame you for taking your time with it as who knows when the series will be complete? Best to savor those! I have this series sat on my shelf, so i'm thinking I need to read it as soon as possible. Jem sounds like such an intriguing protagonist. I just skimmed over this because of spoilers, but if you were hassled to read it then it must be amazing! Sounds like a suspenseful page turner! I have all of these on my shelves at the middle school. So I think I'm going to bring them home over the summer and read them!! Lol. It's true. I am a major bookhassler. But this series is soooo worth it. Lenore, this review makes me so happy! Very circumspect as well. :) I can't wait to talk about it at BEA and hear what you think of KING when you get to it. This is one of my favorite series, ever, and I have an unhealthy crush on Gen. I've got to admit, QUEEN OF ATTOLIA was my least favorite of the series when I first read it, but armed with a greater appreciation for MWT's craft now, I'm eager to re-read. I just finished A CONSPIRACY OF KINGS last week, and Turner continues to be a master at what she does. Is MWT simply not da bomb? She is a genius with these books and I think Queen is my favorite in the entire series (to date). So glad to hear you enjoyed it and you MUST continue! awww AMEN! and yes to Angie's book hassling but wasn't it worth it :) I love MWT and I couldn't have put it better, "Literary slight of hand" :) Love it! I have the first book in this series, and am really looking forward to reading it. It looks like this is a really great series, and I am glad to heat that this book doesn't disappoint! Glad you liked it, and great review!! I just couldn't believe who Gen fell in love with. It made him even more of a fascinating character. This is my favorite of the series. I read them all back to back when Conspiracy of Kings came out. This one made me tear up with it's tenderness.